Six kilometres north of Cahir is a man-made earthen mound known as the Motte of Knockgraffon. This was an Anglo-Norman settlement in the 12th and 13th centuries and would have included a wooden structure on the summit. It is said that, in earlier times, this may have been the location for the coronation of the Kings of Munster before Cashel took over this role. The motte is a National Monument but it has never been investigated archaeologically. If you visit the site it is well worth climbing to the top to appreciate the surrounding view. The Galtee, Knockmealdown, Comeragh and Slievenamon mountains can be seen as well as the river Suir winding through the countryside. Distance from The Apple Farm, 10km. An interesting note on the history of Knockgraffon. 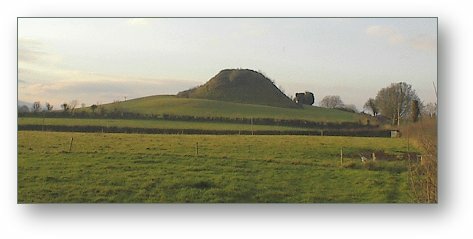 Knockgraffon was originally the sacred inauguration site for the kings of Munster. It eventually became the primary residence of the chiefs of the O'Sullivan clan. In 1192 the Normans successfully wrestled the site from the O'Sullivans and built a classic defensive motte there. Knockgraffon remained in Norman hands for the next 806 years until it was bought by an O'Sullivan (Dr. Gary Brian Sullivan of Statesboro, Georgia) from Donal Keating of Clonmel House. The last O'Sullivan chief to live at Knockgraffon was Donal Mor. To celebrate the return of this sacred site to the O'Sullivan clan, Dr. Sullivan named his son, who was born in 1999, Donal Mor Connor O'Sullivan.